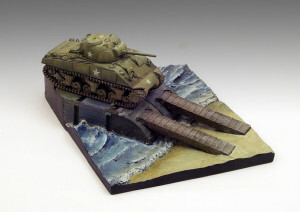 Polish 1st Armoured Division was the only large unit that took part in the fighting in Normandy. Organized on the British model and equipped with mainly American armored vehicles division fought very well to overcome the defense and encircle the German Army at Falaise. Making figures of soldiers of the division is relatively easy with the use of distinctive insignia set of decals from Adalbertus. The first units that took part in the Battle of Normandy were Polish Navy ships escorting the landing of the Allies and bombing enemy’s coastal positions. Cruiser ORP Dragon on June 8th was shelling positions on land and her main guns 152mm repulsed counter attack of tanks from 21 Armoured Division of the Wehrmacht against Sword Beach. ORP Blyskawica and ORP Piorun protected the landing force and took part in the Battle of Ushant (8/9 June), which wiped out last Kriegsmarine destroyers formation operating on the waters of France. In the battle of Normandy were involved eight fighter squadrons and three bomber squadrons Polish Air Force. On the first day of operations fighter wing 131 and 305 bomber squadron within 2nd Tactical Air Force performed 255 sorties. 305 Squadron, commanded by Bolesław Orliński destroyed near Nancy supply 13 million liters of fuel, which is considered one of the most important successes during this battle. First Armored Division of General Maczek in August took part in the fighting in Normandy. The first fight, August 8, 1944 were difficult, overcoming resistance well-fortified enemy. 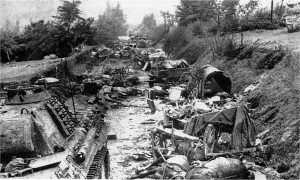 After a week, on the Polish Army Day on August 15 1944 Division broke out at Jort and entered the back of the German 7th Army. From August 19th Division lonely fought in heavy battle of Mont Ormel – Chambois. Divisions orders were to cut the way of retreat of the enemy. Poles inflicted very heavy losses in equipment and manpower of panicked German units. In the Falaise pocket, which have a size comparable to Stalingrad, the Poles closed the bottle like cork and cut remaining German forces. After the battle on August 23 Division was relieved by Canadian units. Selected badges 1st Armored Division from the collections of the Museum of the Polish Army in Warsaw, photo: W.Bułhak. Adalbertus decal set contains insignias 1 division for 24 miniatures soldiers 1/35 scale. You will find Divisional insignias so-called “chipmunks” for the left shoulder. 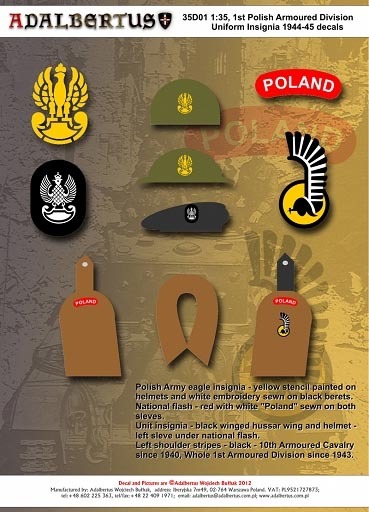 “Poland” shoulder flash on the sleeves and two types of eagles, painted on the helmets from the template and sewed onto the beret. Learn more about the insignia on the site Figus .